To understand how to work with the project architect writing specs, the full-time inhouse specifier or the independent consultant writing specs, you need to identify how many there are and how to best approach them. Numbers from 2012 AIA. AIA shows 17,500 architectural firms owned by AIA members. Very few architectural firms with more than 5 employees will not be owned by an AIA member, if only for marketing reasons. 175 firms - 1% - have 100 or more employees and account for more than one quarter of the profession's total billings. My estimate of the number of full-time architectural specifiers surprises many people when I speak with them. It generally takes a firm of 30-50 architectural employees to support one full-time specifier. I guess that less than 2,000 firms have 30-49 employees. I estimate there are 800 full-time specifiers in the US. This includes W-2 employee specifiers and the 1099 contract independent specifiers who are generally members of SCIP. The United States Census Bureau 2012 Economic Census reports a total of 20,836 architectural establishments. These firms employ 146,277. 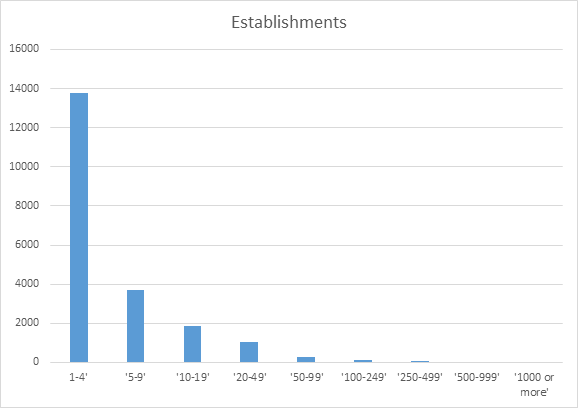 The following chart derived from the County Business Patterns Architectural Establishments shows 66% of architectural firms have fewer than 5 employees and 98% have fewer than 50 employees. Future newsletters will focus on how to identify and meet the specifiers and architectural staff members that make the product decisions.